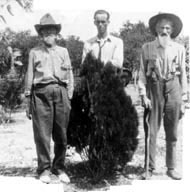 From Tom:"This photo shows Grandpa Myers, Uncle Bill Newton and Quitney Johnson, at least I believe, and more inportantly, my mother believes it is Quitney." Tom is correct--this is a picture of my great uncle, Quitney Johnson. He was the second son of Allie and Eugene Johnson. He was born in 1901. I believe this picture was taken in McGirk. 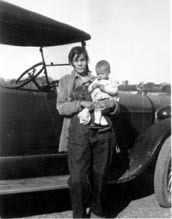 From Tom: "...a photo of Patsy Johnson Hawkins and an unidentified infant. How about that automobile in the background! I'd like to have that today." From Peggy: This is my mother as an infant--Virginia Doris Hawkins Easterwood. She was born in 1925. From Tom: "This is of Wanda Johnson, sister of Patsy." From Peggy: My mother called my her Aunt Nonner because she couldn't say Wanda when she was little. My great grandmother, Allie, made all their clothes. She was an excellent seamstress. I remember her teaching me to embroider when I was a little girl.